The American Friends Service Committee (www.afsc.org) is presenting its Eyes Wide Open Exhibit in State College next week. On April 9th it will be at the State College Friends Meetinghouse on East Prospect. On April 10th-12th, it will be presented on the HUB lawn (I am assuming). 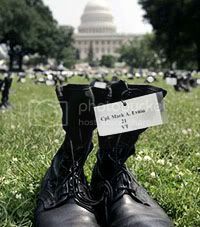 This is a presentation, that plainly shows the human cost for the War in Iraq. I urge all of you to attend!